Violence is the main obstacle to human development. There is an intrinsic link between violence and religion, patriarchal gender violence being the most pervasive expression of religious violence. Mitigating violence therefore requires overcoming the patriarchal mindset, especially in religious institutions. The mission of this independent newsletter is to provide a digest on current research and emerging issues related to human solidarity, ecological sustainability, and religious non-violence. The United Nations' Millennium Development Goals are used as a point of reference. Globalization in Retreat, Walden Bello, Focus on the Global South, 3 January 2007. 2007 Full Analysis of Global Risks & Opportunities, D. K. Matai, Chairman, Asymmetric Threats Contingency Alliance (ATCA), 4 January 2007. full analysis of global risks and opportunities encompassing: spiritual awakening and consumer activism; countering climate chaos; radical poverty and micro-finance; geo-politics, organised crime and extremism; new technologies; pandemics; demographic skews; and financial markets. "The more that humanity communicates and connects, the more it bonds to move beyond physical and intellectual differences towards realising the collective universal consciousness or the Omega Point in the words of Teilhard de Chardin. As global inter-faith dialogue develops, greater connectivity, introspection and inner progress is likely to yield further progress in forgiveness, tolerance, compassion and mercy towards fellow sentient beings, the environment and the alternative points of view in the medium to long term." Pastoral Care In Catholic Church Inadequate, Feel Diocesan Priests, SAR NEWS, India, 16 January 2007. Pakistan places high priority to empowerment of women and gender equality, AP of Pakistan, 17 January 2007. Is another world possible without the women’s perspective? , Patricia Daniel, Open Democracy, 18 January 2007. Original Egalitarian Order of Most Religions 'Hijacked' by Men, Karen Armstrong, On Faith, 19 January 2007. Plutocrats of the People, Daniel Gross, Slate, 19 January 2007. Meltdown of Religious Ice Age Bringing More Gender Equality, Anthony M. Stevens-Arroyo, On Faith, 19 January 2007. Send another Jumbo to pick up the parliament, EU Observer, 20 January 2007. The EU is based on "five principles: Solidarity; Sustainability; Accountability and Security. The promotion of these four around the world constituted the fifth." UN striving to attain millennium goals, Tuma Abdallah, Daily News, Dar-es-Salaam, Tanzania, 20 January 2007. A place to gather in harmony, Rev. Randy Hammer, Times Union, 20 January 2007. Omid Safi at GVSU: Moving Beyond the Clash of Civilizations, S. Slootmaker, Grand Rapids Independent Media, 20 January 2007. Lessons for Living Found in Views of the Last Judgment, Peter Steinfels, The New York Times, 20 January 2007. Nobel laureates say sustainability needs more than science, Erin Allday, San Francisco Chronicle, 21 January 2007. "There are some opportunities in new science that can really change the landscape .... There's not one solution. But it's not going to be a scientific solution or an economic solution. In the end, the public has to buy into this .... without widespread public and government support of energy conservation, technology can only go so far ...."
Gender Equality Still Lacking in Europe's Parliaments, Rachel Ryan, Deutsche Welle, 21 January 2007. Burma 'orders Christians to be wiped out', Peter Pattisson in Kayin State, southern Burma; Telegraph, UK, 21 January 2007. Males are often the invisible victims in domestic violence, Mike McCormick and Glenn Sacks, The China Post, Taiwan, 22 January 2007. Tutu says men have messed up the world and women hold the key, Ekklesia, 22 January 2007. Uganda: Men Must Be Part of Reproductive Health, Kakaire A. Kirunda, The Monitor, Kampala, 23 January 2007. Wealth, poverty, ecology tied to the common good, World Council of Churches, World Social Forum in Nairobi, 23 January 2007. "At the World Social Forum in Nairobi, speakers at a workshop organized by the World Council of Churches (WCC) said that wealth, poverty and ecology are strongly linked to each other and to society’s commitment to the common good." With A Loving God, Gender Equality Reigns, Sally Quinn, On Faith, 23 January 2007. Blood and oil in the creeks, African Shirts, 23 January 2007. World should aim at reducing weapon stockpile, The Hindu, 24 January 2007. Noting that military spending world over has risen to a whopping $1.2 trillion, UN Secretary General Ban Ki-moon has said preventing further expansion of nuclear arsenals and reducing weapon stockpiles should be the key aims of this year's Conference on Disarmament. The war on terror cannot be won unless the world changes for rich and poor, Desmond Tutu tells World Social Forum WCC, World Social Forum, Nairobi, 23 January 2007. "The war on terror will "never" be won "as long as there are conditions in the world that make people desperate," like dehumanizing poverty, disease and ignorance, Nobel laureate and former Archbishop Desmond Tutu told ecumenical participants at the start of the 2007 World Social Forum (WSF) in Nairobi." Seeds of Life - Looking for Alternatives to the Dominant Agrobusiness Model, WCC, World Social Forum, Nairobi, 24 January 2007. Taking risks to protect the vulnerable, WCC, World Social Forum, Nairobi, 24 January 2007. Strategy for Sustainable Development, Kim Sang-hee, The Korea Times, 25 January 2007. Battle for gender equality a measure of social development, Vietnam News Agency, 25 January 2007. "Everyone recognises that gender inequality hurts development. Such inequality needs to be stamped out. .... Gender equality is a measure of social development. The law follows social tendencies. However, we are under the influence of Confucianism. (The philosophy says women must obey their fathers, their husbands and their sons). The inequality is deeply ingrained in our traditional habits and customs, controlling attitude and behaviour towards women." Global 100 List Raises the Profile of Sustainability at the World Economic Forum (and Beyond) , Social Funds, 25 January 2007. Nairobi World Social Forum Comes to an End, Mugumo Munene, The Nation, Nairobi, Kenya, 26 January 2007. "Rallying around the clarion call of "Another World Is Possible", the participants placed social justice, international solidarity, gender equality, peace and defence of the environment on the agenda." World Social Forum scrutinises oil companies in poor countries, Ecumenical News International (ENI), 27 January 2007. "Christian delegates attending the World Social Forum in Nairobi have joined civil society groups in warning about the activities of large oil companies in developing countries. "The companies should put policies in place that make local people beneficiaries of these explorations," said the Rev. Arnold Temple of the Methodist Church of Sierra Leone. Temple's comments followed a presentation at the forum by participants from Nigeria who asserted that oil exploration in the country's oil-rich Niger delta region had led to corruption and pollution." The double dividend, Stabroek News, Guyana, 27 January 2007. Nobel winner assails religious intolerance in L.A. visit, K. Connie Kang, Los Angeles Times, 27 January 2007. "Wole Soyinka of Nigeria calls faith this century's defining issue, and says fundamentalism is the greatest threat to world peace and democracy..... Judaism, Christianity and Islam are completely soaked in intolerance ...."
Understanding Globalization, Gina Speciale, SDSUniverse, 29 January 2007. Discrimination against gay people is like apartheid, says Tutu, Ekklesia, 30 January 2007. The most significant events during January 2007 were the World Social Forum (WSF) meeting in Nairobi, Kenya, and the World Economic Forum (WEF) meeting in Davos, Switzerland. The WSF is a meeting of the world's powerless, while the WEF is a meeting of the world's powerful. The WSF is anti-globalization. The WEF is pro-globalization. The motto of the WSF meeting was "another world is possible." The motto of the WEF meeting was "the shifting power equation." The powerless protested their predicament. The powerful protected their power albeit recognizing that the powerful must do more for the powerless. The bottom line is that globalization is irreversible and is, in fact, the only hope of the powerless throughout the Global South. But the path toward a better balance between the Global South and the Global North is not to engage in power struggles, but to persist in "non-violent resistance" to any form of abuse and insist that the way of solidarity and sustainability is the one and only way for globalization to benefit both the powerful and the powerless. The powerful must be willing to become more powerless. The powerless, in becoming more powerful, better use their increased power for the common good of humanity. All the MDGs are important, but there is increasing consensus that the third one, "Promote gender equality and empower women," is the most fundamental and a necessary (even sufficient?) condition for all the others to be attained. On the other hand, they all assume non-violence as the prevailing social order. None of the MDGs can be attained when violence prevails. Figure 1. The numbered circles stand for the MDGs, 1 to 8; V stands for violence. the most fundamental obstacle is violence (and, in particular, gender violence). The previous issue (January 2007) was focused on poverty (MDG1). This issue (February 2007) is specifically concerned with education (MDG2). Violence is the most pervasive obstacle to the MDGs. Gender violence is the most pervasive form of violence, as it entails 50% of humanity doing violence to the other 50%. Gender violence can be manifested in many forms, some more subtle than others. 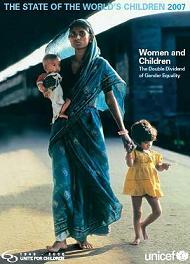 The feminization of poverty (MDG1) is one. 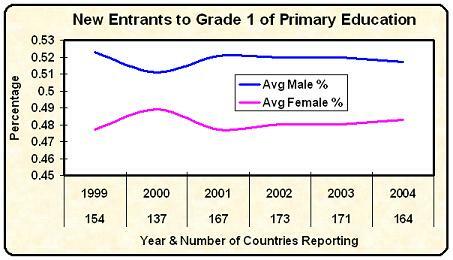 The significant disparity between the percentage of boys and girls who are sent to school (even at the primary level) is another. The UNESCO Institute for Statistics is one of the best sources of education data world wide. The latest education data is readily available online (20 tables, 750 data items). The following trends are shocking. Sice 1999, the gap between boys and girls sent to school has not being closing. This is bad news, as we know that gender balance is indispensable for social development, and it is hard to see how gender gaps in the various professions and social institutions can close as long as many girls stay home while their brothers go to school. Another way to visualize the current situation about MDG2 is by the analysis of the demographics and geographical distribution of primary and higher levels of education. WorldMapper is an excellent tool for this purpose. WorldMapper provides several categories of maps, showing the worldwide distributions of population, wealth, and education. Click on the thumbnails below to compare the worldwide distributions of population, wealth, and primary education. Source: WorldMapper. A number of maps are available for download. The largest fraction of the extremely poor (MDG1) resides in the Global South. The largest fraction of the poorly educated (MDG2) resides in Asia (India, China, ....). The Global North suffers from a case of "obesity" relative to the Global South. The proportion of girls not enrolled in primary school is objective evidence of gender inequality/violence in the Global South and most of Asia. Gender inequality is ubiquitous, but in these regions it is virulent. Children are the future. And "children" means both boys and girls. It is time to extinguish the phallocentric mindset that excludes many girls from going to school. It is time to overcome the "old habits" of excluding women from university education and from some specific professions, such as assuming roles of secular and religious authority. The secular institutions that persist in such practices should be penalized. The religious institutions that persist in such practices should be heavily penalized. Cancellation of subsidies, and heavy taxation will bring to their senses in a reasonable amount of time. Take Action! "Be the change you want to see"
In each page, the links listed on the right-hand column provide access to data and resources pertaining to the page subject. These include tours, graphs, workshops, action checklists, etc., including many high quality materials "free to download for non-commercial educational purposes only." They also sell some of their main publications (click on "purchase" in the footer). Both content and presentation are high quality. These may be among the best educational materials available to the teacher (K to K16) who wants to plant good seeds in little minds. Ease of navigation notwithstanding, a search box would be a useful addition to the site. It was surprising not to find any link to (or mention of) the United Nations' Millennium Development Goals (MDGs). Since there is some measure of worldwide activity guided by these goals, it would be well to inform young people about this global strategy. The report Youth and the Millennium Development Goals, United Nations, 2005, would be a good point of reference. STATE OF THE WORLD 2007: OUR URBAN FUTURE, WorldWatch Institute, 2007. "In 2008, half of the Earth’s population will live in urban areas, marking the first time in history that humans are an urban species. State of the World 2007: Our Urban Future will explore the myriad ways urbanization is affecting our lives and the global environment—with a special focus on the ideas that can make our cities environmentally sustainable and healthier places to live." MUSLIMS IN THE EUROPEAN UNION: DISCRIMINATION AND ISLAMOPHOBIA, EUMC 2006, 118 pages, and PERCEPTIONS OF DISCRIMINATION AND ISLAMOPHOBIA, EUMC 2006, 68 pages. "The disadvantaged position of Muslim minorities, evidence of a rise in Islamophobia and concern over processes of alienation and radicalisation have triggered an intense debate in the European Union regarding the need for re-examining community cohesion and integration policies. A series of events such as the September 11 terrorist attacks against the US, the murder of Theo van Gogh in the Netherlands, the Madrid and London bombings and the debate on the Prophet Mohammed cartoons have given further prominence to the situation of Muslim communities. The central question is how to avoid stereotypical generalisations, how to reduce fear and how to strengthen cohesion in our diverse European societies while countering marginalisation and discrimination on the basis of race, ethnicity, religion or belief." TEACHING AND LEARNING FOR A SUSTAINABLE FUTURE, UNESCO, 2006. This is a multimedia teacher education program. "Running from 2005 to 2014, the aim of the United Nations Decade of Education for Sustainable Development is promote and improve the integration of Education for Sustainable Development into the educational strategies and action plans at all levels and sectors of education in all countries. Visit the official site official site for the UN Decade of Education for Sustainable Development to learn more about projects and events in your region." Links are provided to a large number of key resources. GLOBAL ECONOMIC PROSPECTS 2007: MANAGING THE NEXT WAVE OF GLOBALIZATION, World Bank, 13 December 2006. "Globalization could spur faster growth in average incomes in the next 25 years than during 1980-2005, with developing countries playing a central role. However, unless managed carefully, it could be accompanied by growing income inequality and potentially severe environmental pressures, predicts the World Bank .... growth in developing countries will reach a near record 7 percent this year. In 2007 and 2008, growth will probably slow, but still likely exceed 6 percent, more than twice the rate in high-income countries, which is expected to be 2.6 percent. On how globalization will shape the global economy over the next 25 years, the report’s ‘central scenario’ predicts that the global economy could expand from $35 trillion in 2005 to $72 trillion in 2030. The report includes a number of very informative GRAPHS. AN INCLUSIVE WORLD IN WHICH THE WEST, ISLAM, AND THE REST HAVE A STAKE, Sundeep Waslekar, Strategic Foresight Group, Mumbai, India, 2007, 51 pages. "The greatest challenge of the 21st century is for us to come together to discover our common identity, reaffirm and restore core human values, to appreciate our common history and to create a shared future. An Inclusive World: In which the West, Islam and the Rest have a stake, is an report deriving insight from a study of incidences of terror in all parts of the world and reviews why terrorism takes places in all parts of the world - Latin America, Africa, Asia and the Middle East. It examines why extremism may replace terrorism as the greatest threat to world security and engulf politics of the United States and Europe. It exposes contradictions in self serving Eastern and Western discourse. It also envisages the framework for a sustainable global security architecture, where co-existence triumphs over discord and hope wins over fear. It proposes building blocs of an alternative future that are politically feasible as well as presents action plans for a series of initiatives for leaders, experts, and civilians to collaborate on." ENVIRONMENTAL SUSTAINABILITY: COLLABORATION AND MARKETING BEST PRACTICES IN THE BUILDING INDUSTRY, Global Network of Environment & Technology, January 2007. "To explore the challenges and opportunities facing the design and construction industry in the greening economy, the Sustainable Design Forum (SDF) has released a free e-book, Environmental Sustainability: Collaboration and Marketing Best Practices in the Building Industry. It makes the case for green, dishing out fresh insights and resources to help industry players leverage their expertise for competitive advantage, sell sustainability more effectively, and promote positive environmental change. “The e-book is a treasure trove of advice by professionals for professionals from across the design, development and construction sectors,” Knoop says." BROADENING PARTICIPATION IN BIOLOGICAL MONITORING: HANDBOOK FOR SCIENTISTS AND MANAGERS. Pilz, David; Ballard, Heidi L.; Jones, Eric T. Gen. Tech. Rep. PNW-GTR-680. Portland, OR, U.S. Department of Agriculture, Forest Service, Pacific Northwest Research Station, 2006, 131 p. Information on how to order free hard copies can be found in Pacific Northwest Research Station. In addition, you may download, view, and print the publication directly by just clicking HERE. Please take a look at the Knowledge Organization and Classified Links Directory. Any feedback (comments, suggestions, ...) would be most welcome. Are there any knowledge categories and/or website links missing? Even more important: can you see how to tailor this model to the specific needs of your own research projects? Life long learning is already required to function in many societies, and the requirement for life long learning will become even more pervasive in the future. The prayer-study-action cycle, which may have originated in the Cursillo Movement for training lay leaders in the Roman Catholic Church, is both very practical and very general. If anyone of the three pillars is missing, the process of praying, studying, and taking action cannot continue. The pelican is a legendary symbol of commitment to the service of others, especially those who are weak and most vulnerable to physical and/or psychological violence. See The Physiologus. Gender violence is usually rooted in religious violence. It is the most pervasive form of violence, and the main obstacle to both solidarity and sustainability. See sermon by Rev. Sylvia Roberts. This newsletter is now seeking scholars willing to write (pro-bono) short articles about the impacts of religious violence on human solidarity and ecological sustainability, as well as critical reviews of this work from the perspective of various religious traditions, i.e., Christianity, Buddhism, Judaism, Islam, Hinduism, Sikhism, etc. Articles should be 1000 words minimum and 3000 words maximum, with no images. Please submit only material that has not been already published elsewhere. The author's CV should be submitted with the paper. The newsletter is published monthly, but there are no specific deadlines. Papers approved by the editor will be included as an "invited paper" when time and space allows. Please share this invitation with your friends and associates. Send all correspondence to the editor, Luis T. Gutierrez. "In 1964 the Crowleys were invited by Pope Paul VI to take part in the Papal Birth Control Commission, originally created by Pope John XXIII to advise the papacy on the morality of new contraceptive methods. The Crowleys were one of three married couples expressly chosen for the group, which in its earlier meetings had been composed entirely of clergy, medical doctors, psychologists, population experts and social scientists. By the time Pat and Patty arrived, the commission had gone well beyond the morality of the pill and was asking whether the church should continue to call all forms of artificial birth control intrinsically evil. At their second meeting in 1966, the Crowleys presented the results of a sociological survey of married couples, which they had authorized. It revealed how painful (and unsuccessful) most Catholic couples found the practice of rhythm, the church’s sole approved method of birth control. "The Crowleys were outspoken on the subject. During a heated discussion, Marcelino Zalba, a Spanish Jesuit moral theologian on the commission, asked, "What then with the millions we have sent to hell" if the rules are relaxed? Patty immediately responded in what became perhaps her most memorable quote. "Fr. Zalba," she said, "Do you really believe God has carried out all your orders?" "In the end, the commission recommended overwhelmingly that the strict prohibition against contraception should be lifted, and a belatedly summoned “overseer” commission of cardinals and bishops concurred with the decision. "I don’t think there was a doubt in any of our minds that the pope would follow the commission report," Patty said at the time. But after a two-year wait Paul VI issued the 1968 encyclical Humanae vitae, which flatly rejected the commission report and declared the prohibition would remain in force. "Patty and Pat were quite open and public about their disappointment. Twice in later years Patty spoke to Chicago Cardinal Joseph Bernardin about it, but he could offer little comfort. Some 25 years after Humanae vitae she put her feelings in an article for NCR: "I feel betrayed by the church. The pope continually states that birth control is evil, yet I know that couples must be practicing birth control. One never hears from the pulpit that birth control is intrinsically evil and should not be practiced. Is the church hypocritical?…I long for a church that is honest about its teachings, that admits its errors and faces the effects of rigidity with openness." It is not a matter of dismissing the encyclical's teaching about the intrinsic value of life. It is not the essential content of the document that was massively rejected by Roman Catholics. The real issue is anyone's power to play god with people's lives. Rather than a discourse on the beautiful truths contained in the gospels about the gift of human sexuality, the encyclical was an authoritarian (and futile) exercise in telling married couples when to use (and when not to use) the "pill" and other methods of artificial birth control. It thereby invaded the sacred space of personal conscience for single and married people alike. 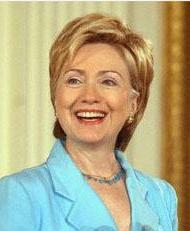 Next president of the USA? The World Future Society will hold its annual conference, "World Future 2007: Fostering Hope and Vision for the 21st Century" in Minneapolis, Minnesota, at the Hilton Minneapolis, July 29-31, 2007. This 2-1/2-day conference will focus on ideas, insights, and strategies for coping with, adapting to, and taking advantage of the tremendous changes occurring on our planet. The deadline for papers is February 28, 2007. If additional information is needed, please let me know: Timothy C. Mack. Blaise Pascal Instituut, Amsterdam Vrije Universiteit July, 4-8, 2007. This is the annual meeting of the Colloquium on Violence and Religion, an scholarly society focused on the exploration, criticism, and development of René Girard's Mimetic Theory. See the conference website for subthemes, deadlines for abstracts, etc. For more information, contact Thérèse Onderdenwijngaard. the 2007 conference of the European Association for the Study of Religions (EASR) will take place at the University of Bremen, Germany, September 23-27. It will be a joint conference of the EASR and the DVRW (Deutsche Vereinigung für Religionswissenschaft). The conference title is "Plurality and Representation. Religion in Education, Culture and Society". For the conference concept and call for papers please take a look at the conference website. Proposals for panel sessions and individual papers may be submitted directly through the conference website. IADIS International Conference, Salamanca, Spain, 18-20 February 2007. The mission of this conference is to publish and integrate scientific results and act catalytically to the fast developing culture of web communities. The conference invites original papers, review papers, technical reports and case studies on the web, in particular the emerging role of so-called Web-Based Communities. Conference contact: wbc-sec@iadis.org. Amsterdam, The Netherlands, 3-6 July 2007. Presenters may choose to submit written papers for publication in the fully refereed International Journal of Diversity in Organisations, Communities and Nations. If you are unable to attend the conference in person, virtual registrations are also available which allow you to submit a paper for review and possible publication in the journal, and provide access to the online edition of the journal. For more information visit the conference website. 2nd-4th February 2007, The Centre for Religion and Popular Culture, University of Chester, St Deiniol’s Library in Hawarden, North Wales. For details, or to propose a paper, please email a title and brief abstract (no more than 150 words) to Eric Christianson, Senior Lecturer, Biblical Studies Co-Director, Centre for Religion and Popular Culture Dept of Theology and Religious Studies, University of Chester. Conference of the National Council for Science and the Environment, February 1-2, 2007, Ronald Reagan Building and International Trade Center, Washington, DC. The conference will address the many essential roles the environment plays on our well-being today, as well as the multi-dimensional relationships between human health and environmental components, which may have far-reaching consequences for society. For more info: NCSE2007. February 28–March 3, 2007, Baton Rouge, LA. This conference is sponsored by the American Society for Environmental History. To submit a poster proposal, please use the proposal submission form. For more info, please contact ASEH Program Committee. April 11 - 14, 2007 in Toronto ON Canada. Call for proposals due October 6. Convened by the Community-Campus Partnerships for Health (CCPH). For information about being a conference cosponsor, exhibitor, advertiser or supporter, contact Shelly Tolo, CCPH Conference Manager by phone: (206) 962-0012 or e-mail: toloevents@aol.com. Conference on Faith, Spirituality and Social Change, University of Winchester, UK, 14 April 2007. A conference bringing together people whose action for social change is informed by their faith, organisations working with faith communities for social change, and academics exploring faith-based social change issues. Proposals - in the form of a title, a short abstract (300 words max) and a brief biographical statement (100 words plus affiliation) should be sent by 1 Dec 2006 to Dr. Christina Welch or Adrian Harris at fssc@winchester.ac.uk. For any additional information contact Christina or Adrian or please visit the conference website. March 14–16, 2007, Le Majestic Centre De Congres, Chamonix, France. The International Association of Science and Technology for Development (IASTED), is a non-profit organization founded in Zurich, Switzerland in 1977. The purpose of IASTED is to promote economic development through science and technology. For more information: calgary@iasted.org. The Jean Piaget Society invites program submissions for the 37th Annual Meeting to take place in Amsterdam, the Netherlands, at the NH Grand Hotel Krasnapolsky, May 31-June 2, 2007. Organizers: Phil Zelazo, Michael Chandler, and Eveline Crone. Please use the Proposal Submission Forms. Submission deadline is November 15, 2006. Point of contact: Chris Lalonde. June 17-21, 2007, Park City, Utah. This is the 13th International Symposium on Society and Resource Management. The theme for the 2007 symposium is "Landscape Continuity and Change - Social Science Perspectives and Interdisciplinary Conversations." Abstracts for posters and papers due January 31, 2007. For more information about the symposium, contact Dr. Douglas Jackson-Smith. The National Women’s Studies Association, 28th Annual Conference, Pheasant Run, St. Charles, Illinois. June 28-July 1, 2007. Theme: PAST DEBATES, PRESENT POSSIBILITIES, FUTURE FEMINISMS. Featured Conference Speaker: SANDRA CISNEROS. For more info: nwsaoffice@nwsa.org. Conference of the Society for Philosophy and Technology, Charleston, South Carolina, July 8-11, 2007. The 2007 conference will be focused on the ways that technology shapes and is shaped by the multidimensional phenomenon of globalization. Proposals should be made electronically to Joseph Pitt, Program Committee Chair. The 18th annual meetings of the Society for Economic Dynamics will be held June 28-30, 2007 in Prague, Czech Republic. The plenary speakers are Dilip Abreu (Princeton), Robert Shimer (Chicago), and Kenneth Wolpin (Pennsylvania). The program co-chairs are Ricardo Lagos (NYU) and Noah Williams (Princeton). A program committee will select the papers for the conference. The deadline for submissions is February 15, 2007. Contact: SED2006@econ.ucla.edu. Havana, Cuba, in 9-12 July 2007. The theme is: "The religious movements in the face of the conflicts and challenges of a world in crisis." Sponsored by the Department of Socio-religious Studies of the Center for Psychological and Sociological Research (CIPS) of the Ministry of Science, Technology and the Environment of Cuba. Abstracts due 20 April 2007. The head of the promotion committee is Sonia Jiménez. Phone: (537) 831-3610 and 833-5366. Fax: (537) 833-4327. Email: quintoencuentro@cips.cu. University of Granada, Spain, 10-13 July 2007. The conference will examine the nature of disciplinary and interdisciplinary practices across the social sciences, as well as the relation of the social to the natural sciences, applied sciences and the professions. The focus of papers will range from the finely grained and empirical (research practices and results exemplifying one or more disciplines), to wide-ranging multi-disciplinary and transdisciplinary practices, to perspectives on knowledge and method. The deadline for the next round in the call for papers (a title and short abstract) is 22 October 2006. See the conference website for other details. The XV International Meeting of the Society for Human Ecology, Rio de Janeiro, Brazil, October 4-7, 2007. Some preliminary proposals for sessions include themes such as: Biodiversity, Coastal Management, Cultural Diversity, Education, Philosophy, and Traditional Populations, among others. This is an invitation to submit proposals for sessions, symposia, and roundtables that we can incorporate into the early stages of meeting planning even before we issue the formal call for papers. If you have ideas, please contact Alpina Begossi, President, Society for Human Ecology, alpinab@uol.com.br or humanecology@coa.edu. Planned for November 2007. This event will be a major milestone in bringing corporate redesign to the public agenda, profiling Corporation 20/20 design concepts and charting a pathway forward. For more info: info@Corporation2020.org.